A couple of months ago, Allianz asked me to be one of ten non-paid Captains of virtual running teams. Just for the fun of it, I accepted and chose Team Chubby as our nickname. 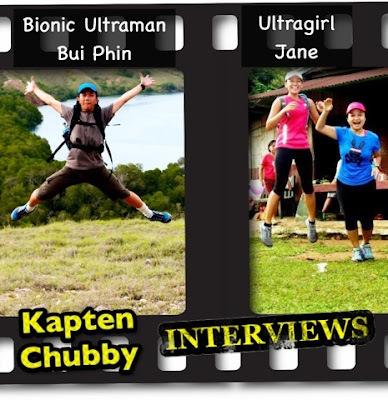 These interviews is one of my efforts to encourage and inspire members of #teamChubby and fellow runners in general. This post is the culmination of those interviews, a small celebration of Indonesian runners, specifically those from the IndoRunners community. These extraordinary people have inspired me to continue running, a rewarding activity through which I've learned lots, both about myself and others around me. Running literally saved my life. Not from a physical illness, but from a Keep-Calm-Don't-Lose-Your-Cool episode. Aki the Trailblazer, who was diagnosed with asthma early on, and ran through and broke that, and countless other, barriers. It's about true camaraderie between runners Ultragirl Jane and Wonder Pipin as they finished their first ultra together. It's about the discipline to wake up in the mornings, day in and day out, to train and prepare oneself for a 100K ultra, exemplified by Bionic Ultraman Bui Phin (who also happens to be a sub 3:30 marathoner). It's about Transformer Sitor turning himself into a new man, shedding over 50 lbs in the process, and becoming a multi-ultra finisher. It's about Speedy Lya, an everyday lady who won a 10K race and got one PB after another in consecutive marathons. It's about 6-packed Ultra-bli Nyoman, a computer programmer who doesn't understand the word quit, and has always come back up from injuries and a couple of DNFs, to continue running one Ultra after another. This post is a celebration of running, and the spirit of these special men and women behind it. What do these seven people have in common? They are all Indonesians. And, they are all runners. Thank you to all the interviewees. Thank you IndoRunners for bringing all of us together. For all members of #teamChubby, stay inspired and let's continue to "Run for Fun. Care to Share!" 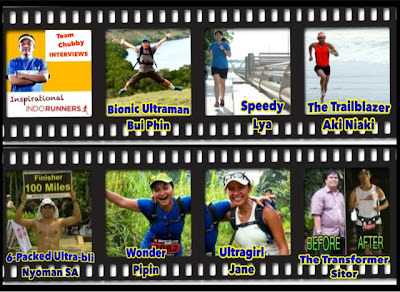 Bionic Ultraman Bui Phin (BP) and Ultragirl Jane (JD). ---Mengapa lari (dan bukan sepeda, nge gym, triathlon)? BP: Karena lari relatif lebih mudah untuk dilaksanakan dimana saja dan bisa kapan saja dibanding olah raga lainnya yang butuh peralatan khusus dan tempat khusus. JD: Saya memilih lari karena faktor kenyamanan. Grab my shoes and run out the door. Kegiatan ini bisa dilakukan di mana saja dan kapan saja. ---Kapan mulai lari, dan sejak saat itu apa beda yang anda rasakan (dari segala sisi kehidupan, feel free to answer from any, or all, aspect)? BP: Mulai lari secara intensive sekitar Maret tahun 2010, yang saya bedakan adalah secara fisik badan serasa lebih segar, berat badan lebih idea dan stamina lebih mendukung untuk melakukan aktivitas-aktivitas lainnya. JD: Mulai lari setelah mendapat tantangan dari teman-teman kantor untuk ikutan Urbanathlon 2011 (hanya bisa sejauh 2km!) Setelah itu mulai ketemu teman-teman lari yang cocok, mulai berpindah dari road running ke trail running. Saya memilih trail running karena bisa menikmati alam (lokal dan luar negeri), udaranya yang bersih dan jauh dari rutinitas sehari-hari (a way to de-stress). ---How many ultra event, and what's the longest running event, you've participated in, and can you share what went through your mind for such a long journey, and were there any point in which it was particularly challenging? BP: My longest run was Vibram HK100, finished in 17h 10m. Sebelum mengikut ajang 100K ini saya sudah pernah lari 50KM di TNF SG dan juga dalam latihan saya beberapa kali lari 43KM sendirian. Yang paling challenging dari event ini adalah saat harus berlari lama dan menaiki tanjakan yang tiada habis-habisnya. Saat sudah mencapai check point terakhir di KM90 justru harus menghadapi tanjakan paling tinggi di Hong Kong sekitar 1 malam. Yang paling berat adalah mengalahkan diri sendiri, karena sering kali merasa ingin santai dan memperlambat namun entah kenapa setelah melewat titik tertinggi Tai Mo Shan langsung muncul seolah tenaga baru dan terus menambah speed hingga di garis finish 100K. Saat melintas garis finish, wow probably my first time to feel such greatest glory. JD: Have done one ultra (50Km), my longest running event: 2012 TNF Singapore. I found it more challenging to stay focus during the training period, not knowing how far 50K is (have never done Full Marathon yet), the boredom of repeating same tracks and streets, and the anxiety to finish the race. Lucky i had a great running partners (yes, a group of lovely friends) who accompanied and motivated me during the training!! ... Moreover, it was great since the three of us have never done it before... At the end, the race day is just another day running with your buddies and the distance didn't seem that long, time flew by as i ran and walked alongside my friend. We chatted and met people from other countries too!!! --- How many marathons (or ultra) have you participated in, and which one is most memorable, and why? BP: Total 8 marathons 1 50K ultra and 1 100K ultra. The most memorable is Jerusalem marathon, my first marathon. The one that made me addicted to marathon. JD: So far, once. My first! ---What is your biggest running achievement (does't have to be race related)? BP: Biggest running achievement is when I can hit 30 days of running in month of more than 600KM. This was intended for my 100K training. Big commitment. Harus rajin bangun pagi, kadang lari 2 kali sehari dan saya selalu bangga kalau mengenang masa-masa itu. JD: That's a bit difficult to say, but i did run + hike to Mount Kerinci and back in one day with great seasoned runners. Almost gave up closer to the peak. It's not the distance, but the steep hills that were tough for me. I'm not loving the uphill running part, but was happy to reach the peak. ---How do you keep yourself motivated, to continue running? BP: Set a goal to achieve in a specific time frame. JD: I just love the feel during and after running, so it wasn't hard for me to go for a run. Especially when I am going to a new trail, new mountain, country side... always something new to explore and see. ---What would be your most important advise, to beginner runners? ---What is your running goal, race wise? What is your running goal, in general? BP: Race wise, I wish I can run Boston Marathon. My running goal in general is for fitness. ---Who's your favorite runner, and why? BP: I can be inspired by any runner even by a very beginner. I was so much inspired by Indorunners members story. ---Describe your favorite shoe (bisa imajinasi, bisa yg sudah ada di pasaran)? "The Trailblazer" a.k.a. si Penembus Batas. Kang Aki sudah menembus banyak "batas" (limitations), dari diagnosa asthma di umur belia, sampai batas jarak lari yg dilalui secara reguler (sering lari jarak ultra sendirian, di jalan maupun gunung!). One of my dreams is to be able to continue running after 50 yrs old. From all the interviewees, so far kang Aki is the most senior, and he SHOWS us that age is not a limitation when it comes to running strong and long. Amat sangat mantap! Four thumbs up! -----Mengapa lari (dan bukan sepeda, nge gym, triathlon)? **Running has always been one of my dreams. It's a pretty cool sport, where you have only your own body to depend on. with no extra help, unlike biking, swimming in a pool or any other certain physical activities. You can pretty much do it anywhere, anytime. By yourself or with anyone else. The reason i only got to do it now is solely because of that i was worried i wouldn't have been able to do it. I was born with asthma and bronchytis. It was so overwhelming that at the tender age of 3 months, they claimed i was helpless. -----Kapan mulai lari, dan sejak saat itu apa beda yang anda rasakan (dari segala sisi kehidupan, feel free to answer from any, or all, aspect)? **I actually tried running on 2000. I happened to see a couple of people did it on the tennis field (which i happen to not do anymore for 6 years). It only lasted for a year ( a slow jog for 20 laps everyday). It was probably due to exhaustion (both tennis and my lack of dietery knowledge) that i got hepatitis A. I stayed in the hospital for 11 days. It wan't until 2010 that i got myself to do it again. I made sure to consult on my health to a doctor this time. I felt okay before. Normal. But after i did it a couple of times, i found myself to be in a way better condition than i've been before. I rarely cough, nor have any asthma episode, i could even drink iced water. It only gotten better after i started trail running for a couple of months. Dan even though i'm not exactly one of those gym bunnies, i can at least claim that i have a pretty good physique. I fell in love with running. Mountain running. Especially when i'm by myself, like having a true me-time. I get to be with my thoughts when i run. And at the same time i could think of planning of my next steps in life ahead of time. This goes along really well with my job as a house planner, where i get strokes of ideas when i run. I even sometimes think to myself "why didn't i thought of that before?". I was perfectly happy before, but thankfully gotten even way happier after running. Like for instance, i stopped and think how awesome it is to marvel at the wondrous nature and surrounding at a short period amount of time. Instant mountain hopping, one day climbing. I went on the morning and got home by the evening. Pretty cool, with little to no fuzz, like any hiking normally would be. -----How many ultra runs (di atas 42.2km) and what's the longest run, you've participated in, and can you share what went through your mind for such a long journey, and were there any point in which it was particularly challenging? **I do a lot of ultra runs by myself. It started from my love and running and the realization that i'm not exactly young anymore. At the age of 54, i'm not able to do any routine training (as much as i probably should have), probably not a good thing to follow either. I do ultra runs to accelerate. Meaning after 3 months of running, i did approximately 50-70k of long runs. By the 5th month, i've done about 80-100 k.
I remember during Bintaro- Bogor- Bintaro, i have the urge to meet with Kang Hendra Wijaya. I had to do it twice, cause he couldn't make it at first (97k). - Bintaro- Muara Angke- Bintaro, 66km. - Bintaro- Tangerang- Karawaci- BSD.95km. -Kamojang, Jawa- Barat Trail Race. 25 +18km(2 etappe). Yes it's only local, but i feel like i should include it. This means the most to me, cause it's my very 1st race. And i got 2nd place, of only 5 runners. Haha..
1st place (by 15 minutes at the 1st ettape, 25 k) was a 40 year old former athlete. The 3rd place was a runner who's started running longer than i had, also in his 40's, presumably also a former athlete. The track was unbelievable. There's one that was about 1 km across a 50 cm deep river with a pretty rough stream, while the surrounding trees are so low that forced us to run while slightly bending over every now and then. I have to thank Muara Sianturi, who also participated. Not for deciding to not join the ettape the next day, but for convincing me to join the race at all. And i'm pretty sure he let me won 2nd place, which he could totally have won if he wanted to. He was one of my mentors, along with Jerry Karundeng and a few others. - Went on a power trail to 3 mountains, Salak, Gede, Pangrango, 65k with Kang Hendra Wijaya, Rudy Ansyah, Djawa, and some few others. - Bandung- Cianjur- Bandung, 99k. At the Run & Roses event with Hendra Wijaya, Bugi. I picked Bugi up who ran from Bogor to Bandung, to give roses for his girlfriend who lives in Bandung. - Bandung Karawang, 92k at the Allianz event. - Kawahputih- Cidaun- Sindangbarang- Agrabinta, 159k with Hendra Wijaya & Rudy Ansyah. -----How many long distance event have you participated in, and which one is most memorable, and why? **The North Face Singapore was the only long run event i've ever participated in. But the most memorable one was probably the Kinabalu Climbathlon that wasn't a long trail race. With a name that majestic, it's also notorious as the toughest mountain trail run event in the world. Of course everyone was more than eager to conquer it. Especially for me, who is more than thankful for being able to partake at this age. And i finished it at a normal pace. The COT was 3hrs 30 mins to the top (the veteran group). During a couple of km left to the top (forgot when exactly), i found a couple of racers to be overwhelmed by it. Like they were starving and thirsty. Some were helping others by bringing them food and drinks till everyone managed to get back on their feet. I was caught off guard for a while realizing how little my experience i had was. So instead of continuing the race, i just stopped and overthink everything that could go wrong. Like what if that happened to me? I didn't realize how long i was stopping. After dusting myself off i continued the race. At 3850 mdpl (The Kinabalu top is 4052 mdpl) i arrived at just the time limit (COT) of 3 hours 30 mins. But for some reason i feel no regrets whatsoever. Even though i longed to win it at first. I felt like i was more than content. Sure i didn't get the medal i could show off to people. But the validation that i could finish the race was enough for me. I didn't participate in any race ever since. After the last Kinabalu event i mostly do local trail run events, and i decided to just do so. Which turned out to be more challenging for me, a lot more fun and more beautiful. I also feel the responsibility to re-introduce my country to people outside. -----What is your biggest running achievement (doesn't have to be race related)? **I think every running experience was a great achievement for me. -----How do you keep yourself motivated, to continue running? **Sport is an investment to our health for now and in the future. And to me running is the best. I think of running as the lowest form of a high health insurance. Not only that, it also make me feel good, and happier. Sounds exaggerating but that's how i feel. -----What would be your most important advise, to beginner runners? Just run, once it is done, the rest is addiction. -----What is your running goal, race wise? What is your running goal, in general? **My goal is to take tiny steps but faster and further everytime. Hopefully by the end of 2014 i could join the triathlon. -----Who's your favorite runner, and why? **My favorite runners are the new ones wo just started but already have high spirits. They're the ones who motivate me to do more. Because no matter how simple running is, getting started is the hardest part. -----Describe your favorite shoe (bisa imajinasi, bisa yg sudah ada di pasaran)? **Barefoot shoes or anything with thin soles. laceless for practicallity. As for dangerous terrains such as cliffs, steep steps i go with Salomon S-Lab. for average category i choose Teva and New Balance. 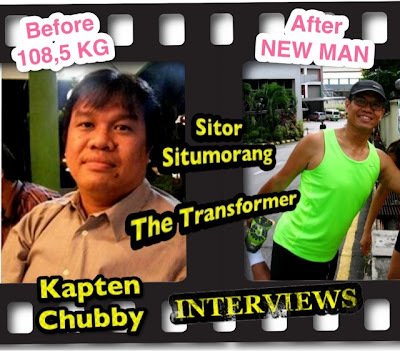 Dari berat 108,5 kg, sekarang bang Sitor sudah "transformed" menjadi multiple ultra finisher DAN 3:37 marathoner! Sitor is HALF The Man he used to be, but undoubtedly MORE MANLY than ever! Minggu pagi gak tau mau ngapain? ....klu nanya bang Sitor, dia bisa ajakin "iseng nyari 42 kilometer yuk..." (dia suka "long-run" full marathon for fun, on his own, no medal necessary). Gila gak sih..... Mantap n Four Thumbs Up! -----Kapan mulai lari, dan sejak saat itu apa beda yang anda rasakan (dari segala sisi kehidupan, feel free to answer from any, or all, aspect. 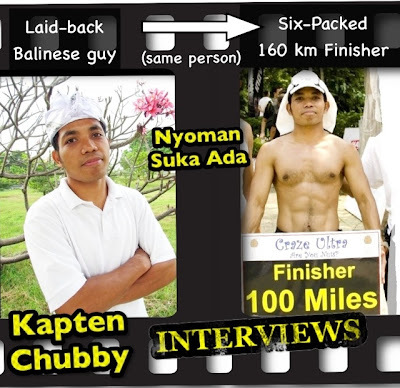 ==> April 2009 karena mesin cross trainer rusak. Lari juga ternyata refreshing. ==> 2 times 100km (1 road ultra n 1 trail ultra). 1 time 50k race. During this long journey in my mind is to never give up, keep moving to conquer the race, iqnore pain, ignore thirst, ignore hunger. Think good things, beloved one especially. ==> HM race 3 times, FM race 12 times, 50k 1 time, 100k 2 times. TNF 100km di Philippines is the most memorable, cos it was such HELL!! I was not trained for this kind of race but I made it by His Grace & Her support. -----What is your biggest running achievement (does't have to be race related)? ==>In 2012, I ran 5,200 km. Full Marathon in 3 hours 37 minutes at Std Chartered Hong Kong 2013. ==> I feel guilty without running. ==> Run your own pace. ==> Nike Pegasus. Now trying to love Brooks. Speedy Lya (LS) and Wonder Pipin (JP). Untuk yg pernah "jajal" Bali Marathon, pasti sudah tau betapa susah nya naik turun selama 42,2 km, di udara yg panas (apalagi di tahun pertama, April 2012) di Gianyar/Bali. Di tahun sebelumnya (2011), Lya bukan pelari aktif. Tapi di event full-marathon pertamanya di Bali, dia finished dgn catatan waktu 4jam 45 menit! Simply amazing! Follow-up nya, di bulan Februari tahun ini, Lya partisipasi di Std Chartered Marathon Hong Kong, dengan new PB = 4 jam 37 menit. Wow! Satu lagi adalah Wonder Pipin, yg enjoy running baik di jalan ataupun gunung dan trail. Saking enjoynya, ultra 50km di TNF Singapore 2012 pun di selesaikan, walau di awal race sudah sempat bruised and twisted. Dan Pipin finish Ultra sebelum pernah full marathon! Pipin juga sharing mengenai betapa berharganya kebersamaan antara IndoRunners, yaitu teman baik nya @jane djuarahadi (yg sdh pernah kita interview sebelumnya), yg stayed with her almost throughout the 50K Ultra, till the Finish line. Running, as these ladies show, is much more than just putting one foot in front of the other. Ke-dua pelari ini sempat nangis while trying to finish their long-distance events. Most importantly though, they both smiled BIG after crossing the finish line! "Don't wait to become better, before joining a running group. Join a running group, so you don't have to wait and become better." ...which group? IndoRunners la yao! Lari itu simple. Peralatannya gak banyak. Etapi, begitu dijalanin rutin dan mulai addicted, ternyata peralatannya lumayan banyak yaaa.. tapi tetap aja gak yg besar dan repot dibawa2 kayak sepeda. Its simplicity, cuma modal niat dan sepatu, lari! Lari bisa dilakukan kapan saja, dimana saja, dengan siapa saja (yg mau lari / jogging), begitu sederhana. Waktu ikut gym, lari pelan selama 20-30 menit untuk pemanasan saja. Kalau lari sebagai olahraga pokok, sejak mulai lari dengan komunitas Indo Runners sekitar akhir May 2011. BTW, saya join Facebook Indo Runners dari Dec 2010 tapi butuh waktu 5-6 bulan buat berani ikut lari. D. Berat badan bisa stabil bahkan turun tanpa diet. E. Liburan/Cuti tahun ini 90% karena ikut lomba lari. F. Kalau ke Mal, wajib masuk toko alat2 olahraga biarpun niat awal kesana cuma mau makan. Mulai lari October 2011, setalah KOTR 2011, karena 5K saya ga finished, berat bgt. Sempat break lari lama juga karena trip. Manfaat lari ga main2, hidup terasa lebih ringan dan sehat, segar. Ada pelepasan stress, bad mood dan beban hidup... Hahaha... saya orang yang suka duduk nyaman, baca buku ato nonton film berjam2 sambil ngunyah. So many excuses not to lace up the shoes and work out! -----How many marathons/ultra event, and what's the longest running event, you've participated in, and can you share what went through your mind for such a long journey, and were there any point in which it was particularly challenging? 2 Full Marathons: Bali & HKG. Waktu itu sudah rajin lari sekitar 11 bulanan. 3 bulan sebelum Bali Marathon saya latihan intensive dengan private coach. Kenapa harus pakai coach (galak pula)? karena saya pemalas dan saya sadar kalau 42Km itu jauuuuh. BMBM was smooth, no major injury for the whole 42K. Mungkin karena persiapannya cukup and I was lucky! "ayo, kalau bisa lari terus bisa finish sebelum 5 Jam nih"
Cedera parah mulai awal October 2012 dan baru mulai sembuh sekitar Dec 2012. - Ngapain sih FM lagi? Nanti Cedera lagi lho? - Badan dan kaki udah gak kuat nih, kenapa maksa sih? - Ini angin sama tunnel kok gak abis-abis? Sempat lari sambil nangis di KM 37 krn dikasih tanjakan (flyover) dikala tenaga sudah habis. Untungnya gak ada yang kenal dan gak tau jalan pulang, jadi mau gak mau lari sampai finish. Eh ternyata bisa finish dengan waktu yang lebih cepat 7-8 menit dibanding Bali. Pain is temporary, pride is forever laaaa..
One ultra: TNF Singapore 50K. It was challenging since the training period, even the race started since the training. Lucky to have such a great running buddies and kompor: Jane & Morris! Itu ultra pertama kami, waktu itu saya dan Jane jg blm pernah FM. Challenging jg waktu itu saya ada trip, sehingga sulit latihan. On the race day, kaki saya udah twisted di kilo2 awal & friction di punggung, luka, sehingga finishing sampai 50K itu bener2 blessings. Tidak ada kata give up, the only option was finishing the race. I was so touched by Jane, yg mau nungguin saya sampai finish, though i've asked her to leave me. She's stubborn! The joy of running or race was togetherness with my friends. Sharing the same passions & supporting each other. -----How many long distance events (marathon and above) have you participated in, and which one is most memorable, and why? The most Memorable is BMBM 2012, as it was my very first marathon. Deg-degan sejak H-30 karena takut pingsan di tengah jalan atau di 'ciduk' sama bis cut off. Dari sebulan sebelum hari H, udah streess. 1 Ultra + 1 Full marathon, most memorable was TNF Sing, celebration of life: determination. Then IVC di gunung Gede, it was in the time i gained weight 3kg & been 2 months didnt run. Tanjakan gila, ngos2an but great terrain and view. It was my great learning moment: training counts & bring your water bladder for trails. Podium 2 di JKT Race 2012. Ini termasuk keberuntungan krn gak banyak pelari kencang yang ikut. My 1st long run 30K before signed up TNF, alone. I did it. - Ikut Challenges di Endomondo. - Beli alat-alat lari baru biar tambah semangat. - Buat janji sama teman2 untuk lari bareng di beda2 lokasi. Having running buddies like Indo Runners and trail runners, keep myself motivated. Sign up the race, reward myself with runing apparels or tunning gadgets if target met. I'm now feel guilty if in a week i dont run, sepatu nganggur. Even i easily envy or feel intimidated seeing someone run or any photosmor pics of running. Weird. - Jangan terlalu cepat mau tambah jarak / kecepatan karena bisa rentan injury. - Ikut lari dengan komunitas / group biar bisa saling memotivasi. Keep running, do the trainings. There are so many theories there, many people say, digest it, but listen to your body... ga usah ikut2an. Enjoy the run, enjoy the trails. In General : Menularkan virus lari ke suami (yang ini agak susah *sigh*) dan anggota keluarga lainnya. Keep running till the rest of my life, so stay injury free. There are so many races, but we only have two legs. Pelari2 dasyat di Indo Runners family. Tapi the most fav. one is Kang Hendra Wijaya. Salomon XR Mission, door to trail, good cushion. Cocok di banyak medan & awet. 6-packed Ultra-bli Nyoman Suka Ada. Last but certainly not least, sit back and enjoy this one! Makasih bli waktunya jawab pertanyaan" ini. "Nggak khusus sih milih lari dibanding sepeda dll. Kebetulan aja lari lebih mudah dilakukan dibanding yang lain-lainnya itu. Sebenarnya sih semuanya itu bagus ya, tapi untuk sepeda, gym, triathlon perlu alat dan/atau tempat khusus. Tapi sekali-sekali sih saya juga melakukan weight training dan naik sepeda statis dan elliptical trainer di gym. Renang terus terang saya belum bisa, tapi ingin mencoba rutin renang untuk cross training. Tapi lari memang olahraga yang paling simple dan efisien minimal dari segi waktu, tempat dan alat." "mulai lari-lari kecil sekedar coba-coba sekitar tahun 2008, tapi terbatas hanya 2-3km, sekali seminggu pun belum tentu, dan bener-bener ngga teratur, bisa sampai sebulan dua bulan juga ngga lari. Tapi saya ingin tetap olahraga, karena kondisi kerja yang harus sepanjang hari di depan komputer lama-lama membuat saya merasa kaku, bahu kerasa nyeri. Pelan-pelan di tahun 2009 mulai bisa sampai 5km meskipun masih ngga teratur juga. Pas awal-awal mulai bisa 5km itu kayaknya mulai deh menjadi terpancing. Ada kesenangan tersendiri rasanya untuk bisa lari sejauh itu, mengingat seumur-umur saya bukan tipe orang yang suka olahraga dan tidak pernah menggeluti bidang olahraga apapun. Dan kayaknya mulai merasakan apa yang di kemudian hari saya dikasi tau namanya 'endorphin'. Kebetulan tahun 2010 diajakin temen-temen kantor untuk ikutan event lari, jadi mulai semakin rutin larinya. Tanpa disengaja, aktifitas lari mulai nagih. Pas aja gitu setelah hari yg panjang berkutat dengan kerjaan, lari membantu untuk melepas penat. Dan apalagi semakin lama bisa nambah jarak 1-2 km, semakin antusias jadinya. Nggak banyak hal yang kita lakukan yang bisa memberi kita efek peningkatan yang bisa dibilang langsung terasa; lari termasuk pengecualian." "Ada 7 ultra yg sampai finish, paling panjang 160km. Apa yang ada di pikiran pas lari? Segala macem sih terlintas ya. Di awal-awal biasanya pikiran konsentrasi dengan strategi untuk pacing dan interval minum/makan. Tapi begitu kelelahan melanda, mulai deh semua pikiran-pikiran negatif bermunculan, apa saya bisa tahan, apa pace saya di awal terlalu cepat atau terlalu lambat, apa akan kena masalah perut, apa kebanyakan minum, ingin disiram air es, ingin makan sup hangat, ingin rebahan, ingin duduk. Trus juga mulai sering memperhitungkan perlu pace berapa untuk bisa sebelum cutoff. Dan yang paling pasti muncul biasanya "ngga akan ikutan yang beginian lagi kalau ngga bisa training cukup". Dan tentu saja pikiran untuk berhenti selalu datang, tapi biasanya ya kita tepis dan berusaha fokus ke usaha untuk mencapai titik berikutnya. Tapi ya kadang kondisi fisik memang benar-benar ngga memungkinkan, perut yang telanjur tidak mau menerima makanan, atau cedera di kaki, ya terpaksa berhenti juga. Ada 3 Ultra yang saya tidak berhasil finish." ---How many marathons (and Ultras) have you participated in, and which one is most memorable, and why? "Yang finish ada 7 ultra dan 5 marathon. Yang DNF ada 3 ultra dan 1 marathon. Paling berkesan itu waktu ikut Vibram HK100 di Hong Kong. Pertama karena hawanya sejuk dan pemandangannya bagus banget. Rasa lelah karena harus naik turun mengikuti pegunungan rasanya terobati begitu melihat hamparan hijau yang sampai jauh dan biru laut di horizon. Trus waktu itu saya lari bareng dengan beberapa orang, jadi kita bisa tetap saling menjaga semangat masing-masing. Ketiga, karena waktu itu training persiapan saya paling bagus dibanding event-event lain yang pernah saya ikuti. Karena secara fisik lebih siap, jadi bisa lebih menikmati suasana dan perjalanan event nya. Yang DNF juga ada yang berkesan. Waktu ikut event H1 di Philippines, kita lari di daerah terpencil banget, dan pesertanya juga sedikit. Serasa bener-bener kayak berpetualang di alam, just you and me and the nature. Meskipun saya tidak finish (cedera lutut), tapi perjuangan naik turun trail dan mendaki gunung melewati rute yang 'tidak manusiawi', kedinginan dibawah guyuran hujan selama 20 jam, merupakan sebuah pengalaman tersendiri. Sebenarnya sih banyak event yang berkesan ya. Event pertama yg saya ikuti, berkesan banget, namanya juga event pertama. Trus ada event Ragunan 21 km juga berkesan banget karena pertama kali saya lari ditungguin pacar hehe. Bali Marathon 2012 berkesan karena saya melamar pacar saya ( Nira Cantik ) di sana haha." "Pernah ikut challenge Nike+, waktu itu kita secara acak dipasangkan dengan satu pelari lain. Jadi 1 team 2 orang, lari sebanyak-banyaknya dalam waktu 6 minggu kalau ngga salah. Hadiahnya trip to San Francisco. Saya dan teman team saya saling support dan memotivasi satu sama lain. Bela-belain lari tiap hari sebelum dan sesudah ngantor, meskipun kaki semakin hari semakin pegel luar biasa dan pace nya lama-lama menjadi semakin pelan. Untuk orang yang sudah biasa lari mungkin lari pagi sore sudah biasa. Tapi buat kita yang hanya pelari santai dan amatiran, berat banget rasanya. Di saat-saat terakhir, kita sampai lari 120km total di hari Sabtu dan Minggu nya, di treadmill! Meskipun ujungnya kita kalah tipis dengan yang nomer 1, tapi saya secara pribadi puas dengan diri saya sendiri karena pas periode itu saya benar-benar 'pushed myself to the limit'. Abis itu saya mogok lari hampir sebulan haha." "Kalau kebayang gimana bebas nya rasanya pas kita lari, apalagi pas saat endorphin sudah bekerja, kaki kanan dan kiri gantian di depan berirama, hati terasa ringan dan sumringah, pace nyaman dan stabil tapi terasa kencang, 10 meter demi 10 meter berlalu... I just can't wait to get out there and run." "Ada banyak hal yang perlu diperhatikan kalau kita udah memasukin tahap lari rutin, karena tahap ini mulai memerlukan perhatian khusus terutama untuk mencegah cedera. Idealnya, jangan tiba-tiba nambah jarak lari terlalu banyak. Saya termasuk yang kurang peduli dengan saran "Don't do too much too soon", akibatnya saya sering cedera. Tapi ya bagaimanapun juga, just run and you will discover yourself. Everything else (pace, distance, gears, races, and injury too) are just secondary." "Race-wise, one fine day I want to run Western States 100. But I don't see myself qualifying anytime soon, so for now it's just a dream. Running in general, I just want to run free, without any specific target or race in mind, run because it gives me peace of mind." "No one runner tops the list, because every runner is different and amazing in their own ways. I admire many top ultra runners (for example, Seb Chaigneau, Anthony Krupicka, Hal Koerner, Mike Wolfe), but I also admire many of my running friends, or even there was this old man I once saw running comfortably in a pair of five fingers shoes just because it fits him, and he didn't know what Vibram is. But there's one name that intrigues me, Yiannis Kouros, his records are unfathomable and currently unbreakable. There's an event that he was forced to start 12 hrs later than the other runners, but still finished 15 hours ahead of the second place runner." Andaikan ada sepatu yang bisa mengkombinasikan New Balance MT 101 dengan Hoka One One." "SALUT amat sangat dengan mental bli Nyoman! 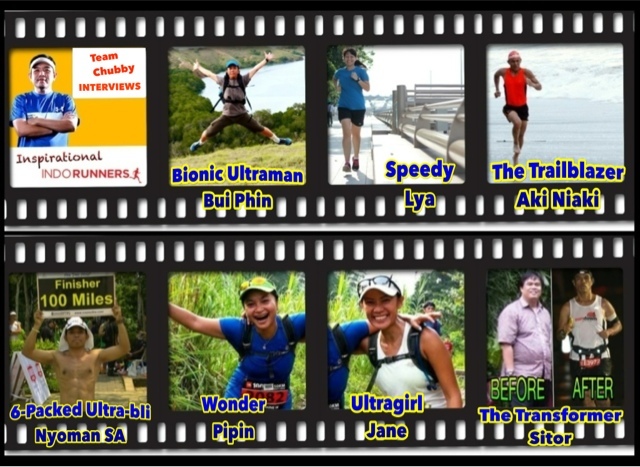 7 ULTRA dan 5 Marathons, amazing! Comment bli Nyoman mengenai DNF (di Philippines) yg berkesan, menggambarkan true runner's spirit, enjoying the run, the sceneries, and not being too affected with the DNF, because... there's always another event, always another run, to look forward to! "Life's not about how many times you fall down, it's about how you get up after each fall." Bli Nyoman is an awesome living personification of the above philosophy! And what about that six-pack! Who knew!? Wow! 10 meters after 10 meters pass.. I just can't wait to get out there and run." luar biasa & very inspiring! look forward to more interviews.